BEVERLY HILLS, CA; July 30, 2018 — Today at the Television Critics Association Press Tour, PBS announced KEN BURNS PRESENTS THE GENE: AN INTIMATE HISTORY, a new three-hour documentary executive produced by Ken Burns, will premiere over three nights in Spring 2020 on PBS. 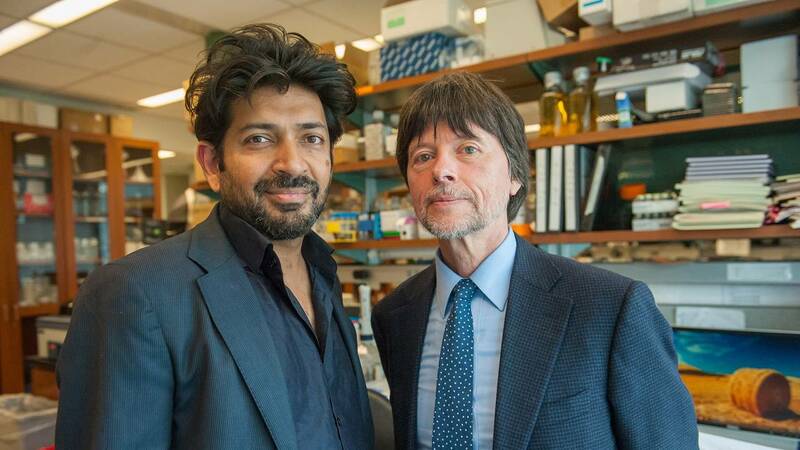 Pulitzer Prize-winning author Siddhartha Mukherjee, M.D., and acclaimed filmmaker Ken Burns will collaborate on the new documentary inspired by Mukherjee’s best-selling 2016 book, The Gene: An Intimate History. Award-winning filmmaker Barak Goodman will produce and, in addition to Burns and Goodman, the film will largely have the same production team behind the Emmy Award-nominated CANCER: THE EMPEROR OF ALL MALADIES, an adaption of Mukherjee’s earlier 2010 book that aired in 2015 on PBS. WETA, a co-producer of the film and the leading public broadcasting station in the nation’s capital, originally announced in October 2016 that the public broadcaster had secured the rights to develop The Gene: An Intimate History into a documentary series executive produced by Ken Burns. Burns and Mukherjee were originally brought together by WETA President and CEO Sharon Percy Rockefeller in late 2010, soon after she read Mukherjee’s book The Emperor of All Maladies: A Biography of Cancer during treatment for cancer at the Sidney Kimmel Comprehensive Cancer Center at The Johns Hopkins Hospital in Baltimore. Now in active production, KEN BURNS PRESENTS THE GENE: AN INTIMATE HISTORY, much like the book, will use science, social history and personal stories to weave together a historical biography of the human genome while also exploring the stunning breakthroughs in understanding the impact genes play on heredity, disease and behavior. From the story of the remarkable achievements of the earliest gene hunters and the bitterly fought race to read the entire human genome, to the unparalleled ethical challenges of gene editing, the documentary will journey through key genetics discoveries that are some of the greatest achievements in the history of science. “We are very pleased to support this important work from Ken Burns as part of our commitment to serving the America people through content and engagement that has the power to inform us on health issues and make a difference in our lives,” said Patricia Harrison, President and CEO of the Corporation for Public Broadcasting. WETA has assembled an advisory committee of leading scientists and National Academy of Sciences (NAS) members for THE GENE that will work with the filmmakers to offer expert analysis of the film’s scientific content. Committee members include Nobel Prize winners Dr. David Baltimore, president emeritus, Robert Andrews Millikan professor of biology, Caltech; Dr. Elizabeth Blackburn, President Emerita, Salk Institute; Dr. Phillip Sharp, professor, MIT/David H. Koch Institute for Integrative Cancer Research; and Dr. Harold Varmus, former director, National Institutes of Health and National Cancer Institute. In addition, the advisory board includes R. Alta Charo, University of Wisconsin/co-chair of the new National Academy of Sciences Human Gene Editing Advisory Group; Dr. Francis Collins, director, National Institutes of Health; Sir Michael Stratton, director, Wellcome Trust Sanger Institute and chief executive officer, Wellcome Genome Campus; Dr. Eric Topol, director, Scripps Translational Science Institute; and Dr. Huda Zoghbi, professor, Baylor College of Medicine and Texas Children’s Hospital. Integral to the project will be an extensive engagement program that will be created by WETA, in collaboration with an array of partners, in particular the National Institute of Health’s National Human Genome Research Institute (NHGRI). Production and outreach funders Genentech, a member of the Roche Group; the National Human Genome Research Institute at the National Institutes of Health; 23andMe; American Society of Clinical Oncology (ASCO) and its Conquer Cancer Foundation; Basser Initiative at Gray Foundation; Cancer Treatment Centers of America; Foundation Medicine, Inc.; Craig and Susan McCaw Foundation; and major funder the Corporation for Public Broadcasting will support project initiatives to expand the reach of the series. The involvement of these partners will enable the film to reach an even larger audience, engaging researchers, physicians and patients in the national conversation about the topic. In the months building up to the national broadcast premiere, the group will organize screenings and discussions in cities across the country, working with local public television stations and a wide range of educational, medical and scientific organizations. In conjunction with the broadcast, WETA will also develop a robust interactive website and social and digital media components, including a multi-media educational initiative designed to engage teachers and students through multiple platforms. KEN BURNS PRESENTS THE GENE: AN INTIMATE HISTORY is a production of Florentine Films and WETA Washington, D.C., in association with Ark Media. Executive Producer and Senior Creative Consultant: Ken Burns. Written by Geoffrey Ward and Kenneth L. Burns; and Barak Goodman and David Blistein. Based on the book The Gene: An Intimate History by Dr. Siddhartha Mukherjee. Produced by Barak Goodman. Executive Producers: Dr. Siddhartha Mukherjee, Dalton Delan, Tom Chiodo and Anne Harrington. Production and outreach funding has been provided by Genentech, a member of the Roche Group; the National Human Genome Research Institute at the National Institutes of Health; 23andMe; American Society of Clinical Oncology (ASCO) and its Conquer Cancer Foundation; Basser Initiative at Gray Foundation; Cancer Treatment Centers of America; Foundation Medicine, Inc.; and Craig and Susan McCaw Foundation. Major funding has also been provided by the Corporation for Public Broadcasting. WETA Washington, D.C., is one of the largest producing stations of new content for public television in the United States. WETA productions and co-productions include PBS NEWSHOUR, WASHINGTON WEEK, THE KENNEDY CENTER MARK TWAIN PRIZE, THE LIBRARY OF CONGRESS GERSHWIN PRIZE FOR POPULAR SONG, LATINO AMERICANS, THE ITALIAN AMERICANS and documentaries by filmmaker Ken Burns, including Ken Burns Presents CANCER: THE EMPEROR OF ALL MALADIES A Film by Barak Goodman, and films by scholar Henry Louis Gates, Jr. Sharon Percy Rockefeller is president and CEO. More information on WETA and its programs and services is available at www.weta.org. Ark Media was founded by Barak Goodman and Rachel Dretzin in 1996, and they were joined by partner John Maggio in 2003. Together, Goodman, Dretzin, and Maggio have grown Ark into a leading producer of non-fiction series, theatrical documentaries, and television specials on a wide variety of subjects, along the way nurturing a diverse roster of passionate and talented filmmakers. Ark’s films have been honored with four national primetime Emmy Awards, an Academy Award nomination, multiple Writers Guild Awards, two duPont Columbia batons and three George H. Foster Peabody Awards, among many other awards and accolades. Coming soon: the feature documentary adaptation of Andrew Solomon’s monumental nonfiction book, FAR FROM THE TREE, in partnership with Participant Media; an AMERICAN EXPERIENCE film about Teddy Roosevelt’s fateful journey down an unknown Amazonian river in 1914, which almost cost him his life; a film for MSNBC about the press during the civil rights era; and a four-part series about genetics, based on Siddhartha Mukherjee’s best-seller The Gene: An Intimate History. The Corporation for Public Broadcasting (CPB), a private, nonprofit corporation created by Congress in 1967, is the steward of the federal government’s investment in public broadcasting. It helps support the operations of more than 1,500 locally owned and operated public television and radio stations nationwide. CPB is also the largest single source of funding for research, technology, and program development for public radio, television and related online services. More information about CPB is available at www.cpb.org.